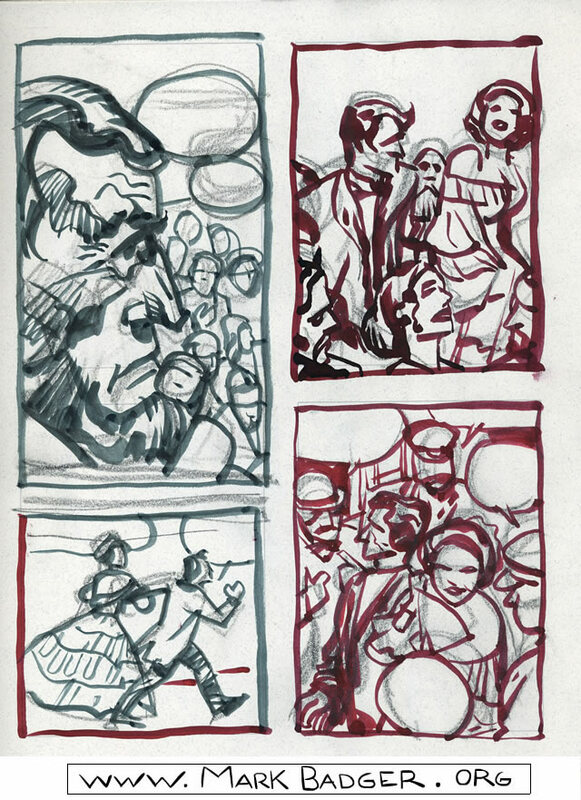 Visually, the usual trick is to steal another artist’s style, or render more, or draw more photographically. You can even try and draw in the current “house style” whatever your market is. Just doing a lot of work helps, if you try and draw what you see in your head. I’ve been drawing a Kirby page, sort of daily for the last two years. My visual vocabulary has changed. Figures now have larger black shapes running across them. I try not to worry about correct form as much as energy. Large figures and closeup have appeared in my work. I have panels occasionally, where I swipe Kirby directly. 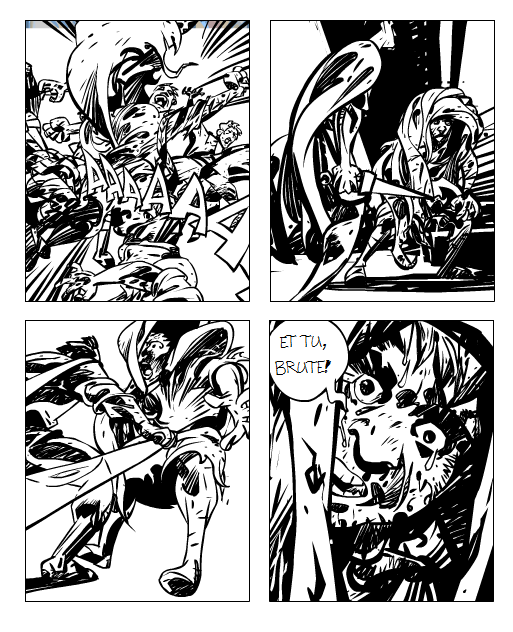 Rome has become some sort of Kirby mix with traditional drawing in it. Yet Kirby’s vocabulary doesn’t work well with Shakespeare. With every day drawing, comes the every day questions of, “why are you doing it this way?” Shakespeare didn’t think in sequence of images, or even make pictures. The whole story was done in speeches. To handle the language I need to add something else to my mix. I’ve been unable to integrate Kirby and doing Shakespeare in a way I am happy with. Studying Jack’s amazing work, hasn’t provided me with a form to deal with Shakespeare’s rhetoric. I need to add something else to the mix. Some of Charles Schultz impeccably timed comic strips to fold into the skillset. But how do I teach myself to add new things into the fold when I don’t know what I’m doing. Study, yes, but there has to be something more. When teaching student’s you have to break a skillset down into small teachable tasks. Then provide a way for them to practice those tasks to develop actual skills. Eventually you want students to be able to analyze a problem and create a new solution using their skillset. Teaching isn’t just giving students the fundamentals. Bad teachers just provide code to copy, here’s a database , here’s how you fill it in, here’s how you make a menu for a store. Then when the student has to solve another problem their lost. That is what I have been doing blindly copying Jack. Expecting the daily exercise of lifting weights to provide me a new skill set. Buddhists talk about meditation as practice. Sit, paying attention to what comes up, is practice for when my printer farts out as the deadline arrives. Then my mind is trained to focus, and not react to momentary events like a broken printer. The printer is just one more event to work with. But it takes a lot of practice with the breath before I stop throwing printers out the window. 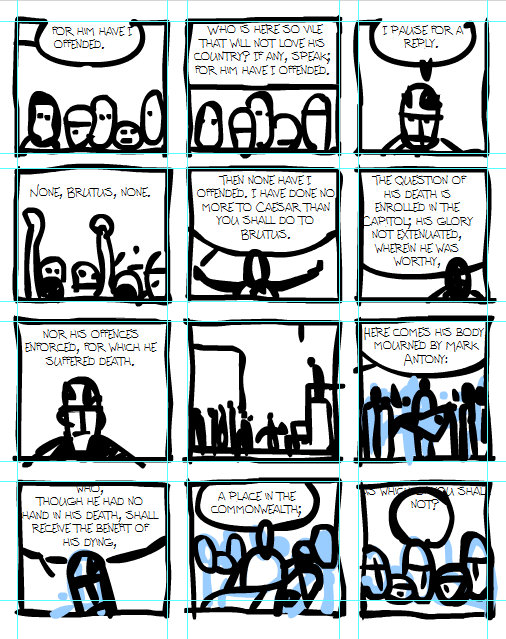 As an old artist working to draw better, I need to develop a set of practices that treat comics as a practice. So I can work on the foul shot, the defense the passing, so when the game happens I can just draw. I need things to breathe and pay attention to in my drawing. Build a study practice with Peanuts. Art isn’t a game, it’s just expression of an idea. Except it’s probably more of a game given the renumeration. It’s interesting to read about LeBron James’s return to Cleveland. They picked out how he was not a complete player when he left Cleveland, it wasn’t just the teammates when he left. He focused on parts of the game he wasn’t as good at and slowly added the new skillset to his toolbox. He had to keep practicing. You hear about sports stars playing their games and so much of it is built on their practice to get good they can respond in the immediate moment. What’s practice for comics people? We never do anything that is just fooling around with an idea to master the idea as one thing to add. Every story is supposed to be a masterpiece. So what I really need to do is make a practice of practice for myself. Sometimes people look at other work. Sometimes people go to life drawing. Sometimes people talk about ideas that are in the air. 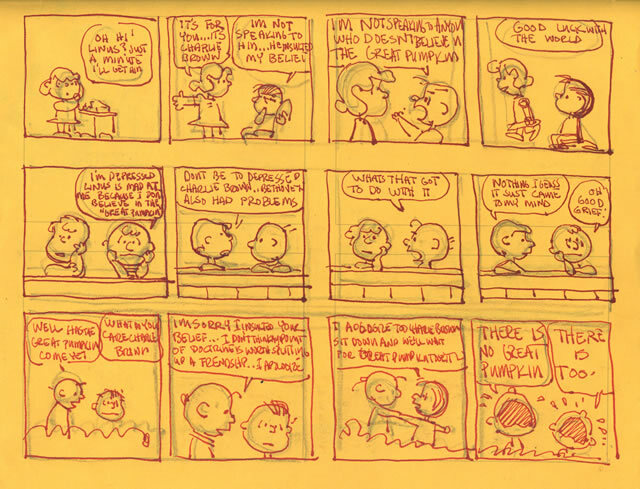 So I copied Peanuts by Charles Schulz, because he has mastered dialog and timing. 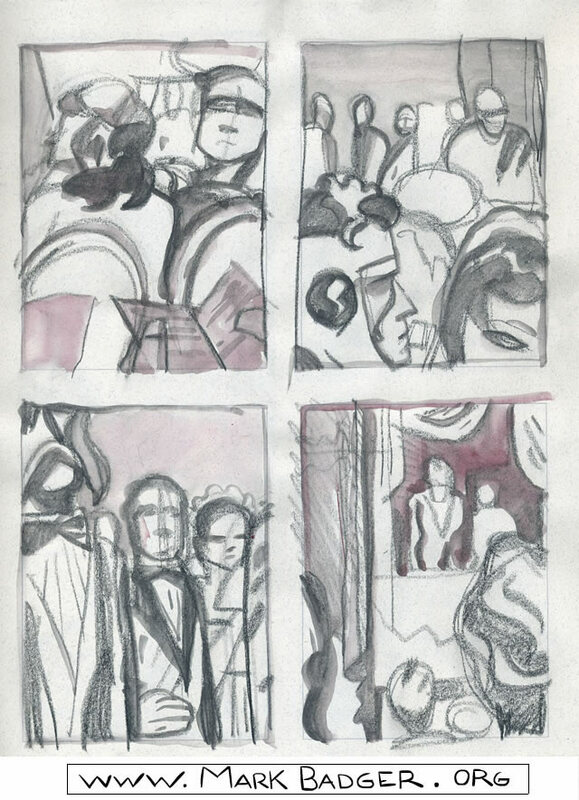 And I even started doing tiny little practice pages before I thumbnailed out my actual pages to see if I could learn something. But it wasn’t working. I couldn’t figure what I was doing. I need to look closer at what practice is.